Eleven Oaks – christopher consultants, ltd.
christopher consultants provided civil engineering, land planning and surveying services to developer Madison Homes for the development of Eleven Oaks. Architect Deveraux and Associates also provided design work on the project. christopher has worked on Eleven Oaks since 2012, from conceptual development plan through final site plan and stakeout. Our survey team provided stakeout of the housing pads, sidewalks, curb and gutter, retaining walls and utilities on the site. christopher’s engineering team provided preliminary and final stormwater management and best management practices, storm and sanitary sewer and forcemain, erosion and sediment control, and outfall analysis. christopher’s staff arborists and landscape architects also worked on the site, providing landscape planning, tree location, tree identification services and a tree preservation plan. The project is located across two jurisdictions, Fairfax County and the City of Fairfax. christopher coordinated the permitting with both jurisdictions for the client, provided support for public meetings and incorporated County and City comments. christopher also provided final constructability and construction QC review. Eleven Oaks is a community of 49 townhomes, city homes and single family homes located in downtown Fairfax, adjacent to George Mason University. 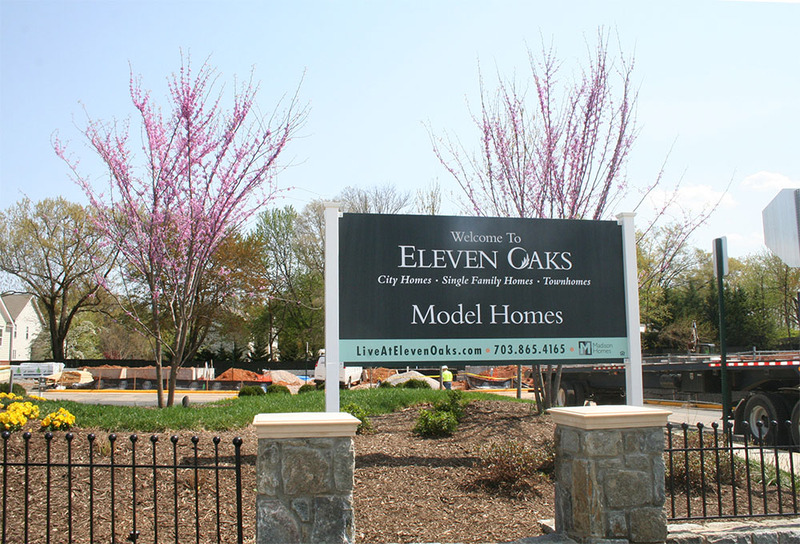 Just blocks from downtown Fairfax and a wide range of shopping and dining options, Eleven Oaks features homes ready for immediate delivery as well as the ability to order a customized home. The project is currently under construction, though fully-decorated model homes ­­are currently open to visitors.